This Nativity sensory bin is an easy way to celebrate a most special day, from long ago and far away! Children will love learning about the Nativity and retelling the story through play. I have so many memories of being a kid at Christmas time. I loved watching as our own nativity set was carefully unpacked and each porcelain piece gently being removed from the tissue paper & bubble wrapping. Each piece placed safely in the manger higher than my little fingers ever could reach. We could look, but we couldn’t touch. I believed my mom tucked the manger up so high because just breathing on the pieces would cause them to tumble and fall. Silly right? Because my mother took such good care of that nativity my kids will get to see the same pieces I did as a child. It’s true that when you become a parent yourself you want to put your “own stamp” on each season so a few years ago we purchased a nativity set just for them. No porcelain pieces here! With a Nativity sensory bin their own, they just might leave your holiday collectible alone. all inside a rubber maid tub-this way I can put the lid on when the play time is over. Now my kids have their own nativity set that they can rearrange as many times at they like! I truly enjoyed watching my own children play with and talk about the baby Jesus in past holiday seasons and I look forward to more fun and meaningful play this upcoming season with my little ones! 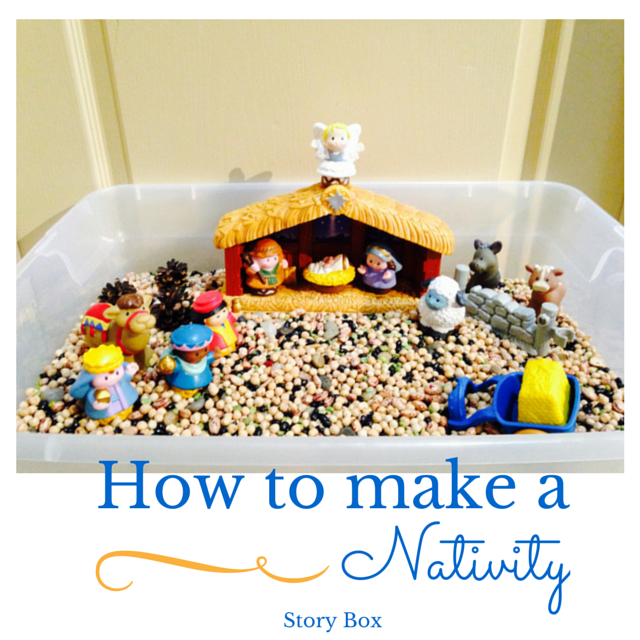 Do you let your little ones play with your Nativity sensory bin? This is so sweet! I think we’ll try making one this year. What a great idea. Super fun for the little ones this holiday season! I would love to do something like this, but I’ve found a bean in my kids’ nose twice from other sensory bins! I’m thinking we might need to stick with rice. When I was little I stuck a bean up my nose and my dad had to take me to the hospital to get it removed. My kids shoved bits and pieces of blanket and apple chunks up their noses so I totally understand what my father went thru! What a great idea, especially for toddlers and young preschoolers! I think my daughter would have fun with this. I’ve actually been wanting to get her the Little people Nativity Set, It’s adorable and I love that children can play with the figures! The hardest part is making sure that all the pieces go back in the box at the end of the season. We found some of the wise men under the sofa…. oops! I have never thought of this. Awesome idea. I never would have thought to make a nativity sensory bin. That is so awesome. What a neat idea. This was an interesting way to make a toy children can play with and enjoy in different ways. This is a very unique idea. Thanks for sharing with us. Very very cute and such a great way to tell a story and play. I never thought to do this with the little people. It makes so much sense. What a great idea! I’ve never thought of this before and there are so much benefits to it too. What an adorable idea. It’s something that can be pulled out once a year – a memory they will have for years to come. Sensory bins are great tools to teach little ones. This one is very creative. Such a clever and unique way to celebrate! What a great way for a child to learn. I love that a lot of toys and activities now focus more on a child’s whole self. That is just so super-cute. I love the Nativity theme. Just perfect. What a great idea! Simple and fun and perfect for the holidays! Cute idea and sounds much safer than the porcelain version. What an adorable idea! Very sweet! Thanks for sharing! That is such a wonderful idea! I would have never thought about that. This is the neatest idea for a sensory bin. I really love how you went about it! Love that you are teaching your kids about the real reason for the season. I love this idea! What a great idea. I love that it’s Christmas themed, too! So cute.